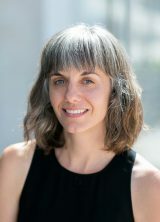 Krista Eastman is a writer and editor with expertise in university communications and external relations. In her role as administrator for the Center for Journalism Ethics, she assists with strategy, communication, event planning, and special projects. She holds a BA in English and French from the University of Wisconsin–Madison and an MFA in creative writing and women’s studies from the Pennsylvania State University.